There’s no better time for families to begin making an emergency preparedness plan than now. 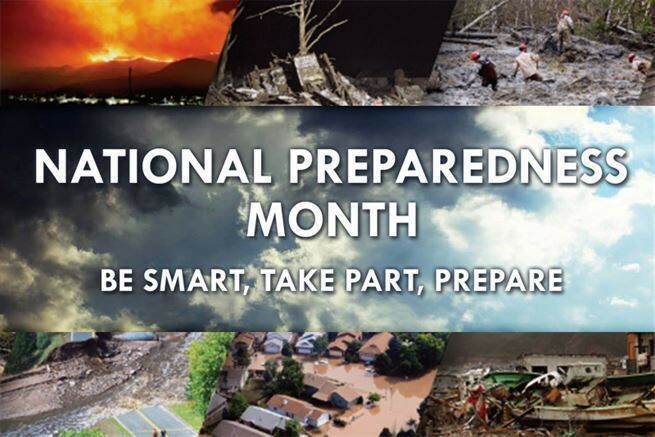 This September marks yet another National Preparedness Month, and local authorities encourage all residents to establish and communicate strong emergency preparedness plans with family members and friends. “I would also urge all residents to heed local warnings and make the appropriate preparations in a timely manner. Residents should review their own plans and make sure the whole family knows what to do,” Mayor Phil Garwood said. One of the top ways emergencies present themselves is through natural disasters. Whether it be tornados, lightning strikes or superstorms, these natural phenomena can cause serious and even fatal implications. To best prepare, families should develop a plan based on an individual’s whereabouts, including whether he or she is at home, work, school or outdoors, and identify a safe place to take shelter and have frequent drills to practice these techniques. Families should also have knowledge about the county where they live, keep a highway map nearby to follow storm movement from weather bulletins and have a NOAA Weather Radio with a warning alarm tone and battery back-up to receive warnings. If severe weather threatens, it should also remain a priority to check on people who are elderly, very young or who are physically or mentally disabled. “Every family should sit down and prepare an all risks emergency response plan. Go to www.ready.gov for plan information. Get a NOAA weather alert radio and monitor storm alerts. The radios are inexpensive and battery operated. All our township buildings and schools have been provided with one of these radios to warn of an impending emergency condition,” Lieber said. According to the U.S. Department of Commerce, initial steps to take when designing a family disaster plan should include gathering information about hazards to find out what type of disasters could occur and how you should respond. Next, a family should meet together to create and discuss a thorough plan that includes two places to meet — a spot outside of the home for an emergency and a place away from the neighborhood incase the family cannot return home. An out-of-state friend should be a designated “family check-in contact” for each member to call in case of separation. When implementing a family’s plan, is is imperative that emergency telephone numbers be posted by a phone, that safety features such as smoke detectors or fire extinguishers be installed in the house and that the house is also inspected for potential hazards. Teaching all members of the family basic safety measures, such as CPR, first aid and how to call 911 are also a must. Additionally, it is a good idea to keep enough supplies in the home to last for at least three days. “The things that [the Moorestown First Aid and EMS] feel are important are the importance of calling 9–1–1 for all emergencies, making sure that home addresses are visible from the street, that everyone should learn CPR to increase the chances of saving a loved one, and considering installing or purchasing a key lock box and giving the code to the Moorestown Police Department for the sick or elderly to allow access to the home in the event that a door cannot be unlocked for us,” James Plagge, assistant chief of Moorestown First Aid and EMS, said. In the interest of keeping residents informed in times of critical incident, there are four free programs the township utilizes for notifying residents. These programs include the “SWIFT 911” community notification system, the Nixle public alerting system, Twitter and the township website. For more information on these programs, visit http://www.moorestown.nj.us/358/Emergency-Community-Sign-Up-Notification.